As Vice Chair of the Society I am delighted to welcome our new Chair, Margaret Lenton, who took on the role in June after unanimous agreement by our Executive Committee. Margaret was able to be present at the Royal Albert Institute Concert, her first event since becoming Chair, and she is now in the process of familiarising herself with the Society and settling into her new role. Margaret will introduce herself personally in the next Newsletter, and I’m sure you will all want to join me in wishing her well for her tenure as Chair. Those of us fortunate enough to get tickets enjoyed a wonderful evening at Cumberland Lodge on June 6th at the concert performed by The Queens Six, and supported by The Royal Albert Institute Trust. The weather was wonderful, and after drinks in the garden the audience were treated to a concert of the highest musical standards. The Queens Six, who make up half of the Lay Clerks of St George’s Chapel, had recently sung at the Royal Wedding. It was a rare privilege to hear them sing an entertaining performance of music ranging from William Byrd to The Beach Boys. The vote of thanks was given by Margaret Lenton at her first event as our new Chair. Since the May Newsletter the committee has been very busy considering many applications and writing about the following. We wrote in objection to this proposal affecting a dwelling in a terrace of two storey Victorian cottages. The Inner Windsor Conservation Area Appraisal highlights the importance of uniformity in such terraces. We considered that the proposal was not of a good standard of design as required by NPPF Section 7 and would fail to conserve or enhance the character and appearance of the Conservation Area. Refused and now sent to Appeal. This appeal has been dismissed. Unfortunately the dry weather has not been helpful to the completion of this area. The graves have now been turfed over and the new planting is complete. We hope that the lack of water will not harm the growth. Thanks are due to Allan Boothroyd for his work with RBWM to complete this project. We wrote to RBWM congratulating them on the work undertaken as part of the Facelift prior to the Royal Wedding including the floral displays around the town. However, we also noted the lack of floral display in Charles Street and Church Street Heritage Garden. Replacement of the floral boxes in Charles Street is now underway. We wrote to the relevant local councillors as there has been considerable activity by surveyors and tree fellers in this area. We consider it is supremely important that the grass verges, hedgerows and trees of various sizes that line this gateway into Windsor should remain, even though there is the prospect of a large housing development on this site. 4 The Swan Public House, Mill Lane. We supported the nomination for this to be designated an Asset of Community Value, which has now been registered by RBWM. We await further updates on the progress of this site. The first of our eight talks of the season is on Wednesday 12th September at 8pm in Upton House School. The speaker is Mark Piper, the Executive Director of the Theatre Royal, Windsor, who will speak on the History of the Theatre. The full programme of talks for the 2018/19 season accompanies this newsletter and we look forward to seeing many of you at these events. We left Windsor on a rather overcast morning and arrived at Wilton House after an excellent journey. We were greeted on arrival by Roz who welcomed us and gave a brief talk on the House, which has been the home of the Earls of Pembroke since the 1540s and is first and foremost a family home. Since 1544, when the buildings and land were granted by Henry VIII to Sir William Herbert, Wilton House has been linked to the political and artistic circles of England. After we left the coach we headed off, as usual, for morning coffee then spent a relaxed time visiting the House and grounds. The House is a treasure trove of beautiful art, furniture and other treasures. The magnificent state rooms at Wilton, designed by Inigo Jones, include the The Single Cube Room and The Double Cube Room. The House also has a world famous art collection by renowned artists such as van Dyck, Pieter Brueghel and Rembrandt. The grounds in which the House is set are beautiful, in particular the Rose and Water Gardens. The day was enjoyed by all the 38 members who took part in the visit. Bowood House is home to the Marquis and Marchioness of Lansdowne. It hosts a wealth of unique art and antiques with many historical treasures – the Library and Chapel, the laboratory where Joseph Priestley discovered Oxygen in 1774, the Sculpture Gallery, the Orangery and a range of exhibition rooms. The House is surrounded by 2,000 acres of Grade 1 listed ‘Capability’ Brown parkland with a mix of plantations and sweeping lawns leading down to a mile long lake, the Italian inspired terrace gardens and the herbaceous border surrounding the Georgian house. Our first stop will be in Cirencester where there will be time for lunch before we go on the short journey to Rodmartan Manor. The Manor is a supreme example of a house that was built, and all its furniture made, according to Arts and Crafts ideals. Set in delightful gardens it is one of the last country houses to be built and furnished in the old traditional style when everything was done by hand with local stone, local timber and local craftsmen. 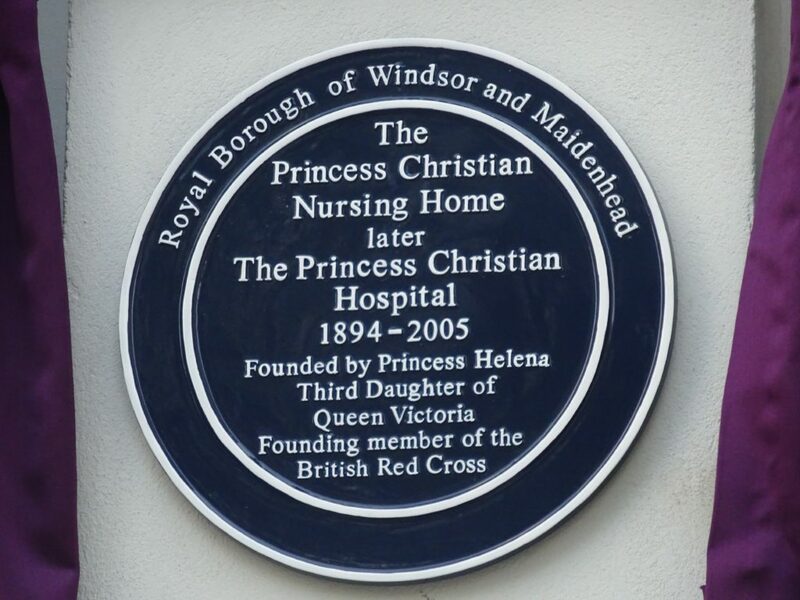 It was with some horror that Windsor residents learned in spring 2015 that the new development of the former Princess Christian Nursing Home in Clarence Road was to be called The Residence. This reflected nothing of the building’s heritage or its founder. The Windsor and Eton Society together with the Windsor Local History Group finally made contact with the developer in May 2015 and it was three years later, on 8th May 2018, that our objective was finally achieved with the unveiling of a blue plaque. Contact with the developer provided no real progress but eventually in the autumn of 2016 contact was made with a resident. We then met with the owners of Apartment 5, which has the stepped entrance to the building with the crest over the door. Vivienne and Deesch Papke are a charming couple who were very much in favour of a blue plaque, as were all the residents of The Residence. The wording for the plaque was finally agreed and also the details for an Information Panel to be mounted by the front gate. Vivienne and Deesch very generously offered to fund both of these, for which we are very grateful. On 8th May the unveiling took place by the Mayor, Cllr. John Lenton together with his wife, Margaret. This was attended by a good number of Windsorians who then adjourned to the Guildhall for a short reception.